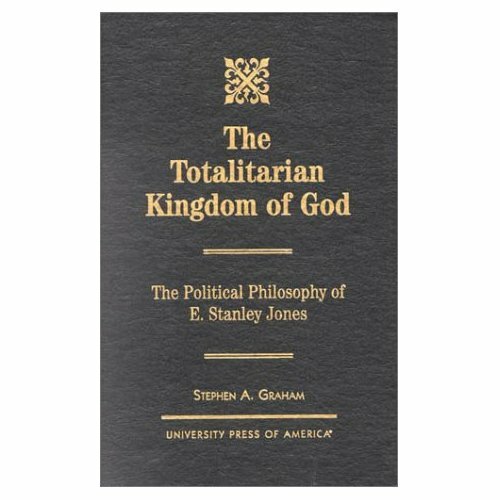 The Totalitarian Kingdom of God provides the first examination of the political philosophy of E. Stanley Jones and establishes him as one of the leaders in twentieth century American political thought. Jones published twenty-eight books and was deeply involved in politics as a close friend of Gandhi and Nehru and a major direct influence on Martin Luther King Jr. He was also a prominent opponent of Japanese imperialism in China and the Philippines, and personally intervened with President Roosevelt immediately before the attack on Pearl Harbor, nearly succeeding in delaying or preventing the war in the Pacific. However, his role as a Christian missionary and evangelist led to his actions in politics, with special significance rising from a trip to Russia in 1934. He developed a philosophy of the kingdom of God through the Gospel of Jesus Christ which offers the believer not only personal salvation but also social, economic, and political salvation. This study of his ideas shows how he confronted the challenge of communism, Nazism, and Fascism in the 1930’s and 40’s, and how they applied to American Democracy after World War II.